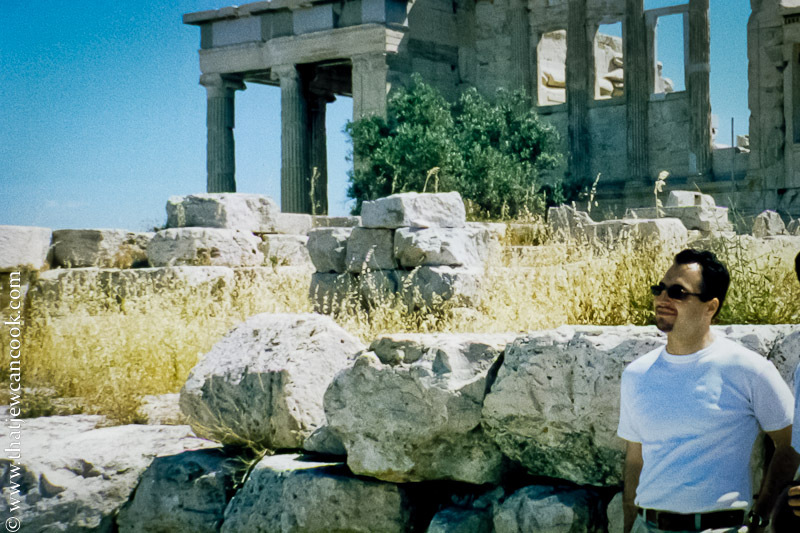 A long, long, long time ago a few friends and I vacationed in Greece. 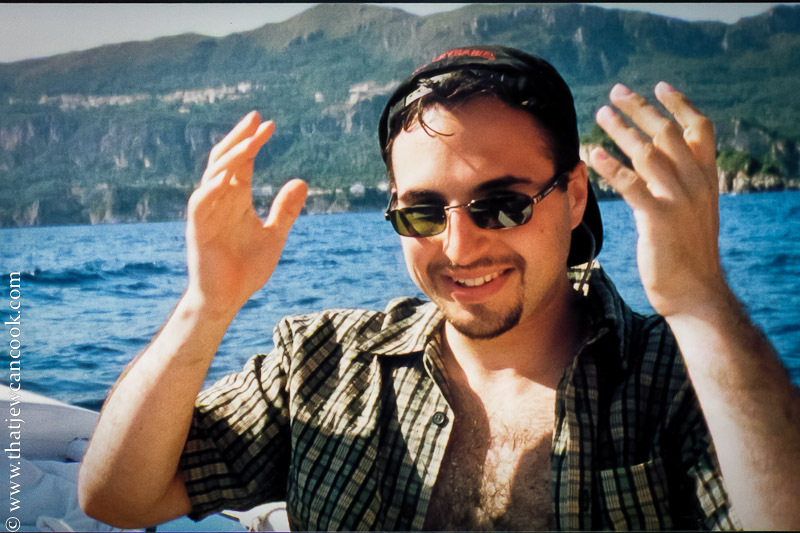 In fact, it was so long ago that this picture was taken with film and I had hair. Do you remember film boys and girls? I don’t remember having hair! It was on this trip that I picked up a love for Greek flavors and I still have a soft spot for simple Greek salads. Feta all the way baby. One fine evening in Corfu we found a restaurant off the beaten path and away from all the pesky tourists. So, we hunkered down in this rustic space and filled ourselves up on some local down home food, wine and ouzo all night. I think the bill wound up being something insanely cheap, like 15 bucks a person (and we probably got ripped off!) No one was in a condition to drive so we stumbled home and I can’t recall much else from that night, except for the beans. Oh, the beans. They still make me drool on command. The best way for me to describe it is a lima bean casserole with tomato sauce and feta. It only took me 15 years to try and make this dish. I had just purchased a pressure cooker, and this seemed like a good way to take it for a spin. So, as my good friend Val reminded me — how did it taste? Pretty damn good, but I think the one in Greece was better. Maybe if I add a little fresh dill or ouzo? Or maybe I just need to add more Corfu! Makes a large side dish, enough to feed 4-6 people. I just ate it alone and there was a mess left over. small block of feta, crumbled. I would guess about a cup, but don’t let me stop you from adding more. Drain the beans reserving 1 cup of bean juice. Pull out any stray bean skins floating around. Mix in feta, and about a tablespoon of kosher salt (taste it and adjust, I didn’t really measure the salt and it really depends on how salty your feta is). Serve with a lemon wedge, red wine and chase the whole meal with some ouzo. Opa! What a great recipe! love your blog man! came across it on foodgawker, and you have some awesome posts here! And, why is it that a man can lose his hair and look as good, or better than when he had it? And, women? It is just not the same. Why is that? 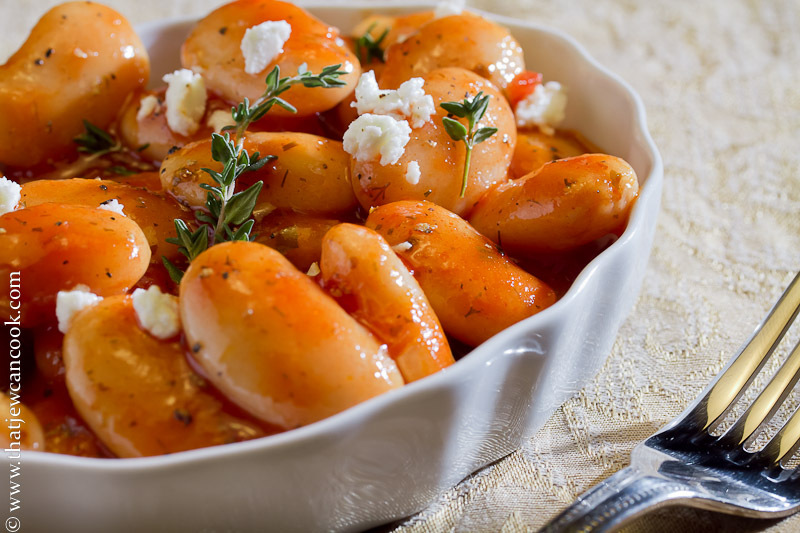 Yes, more Corfu may be the secret ingredient, but this recipe sounds good enough to make me want to try lima beans again 🙂 Congrats on having your photo accepted by Foodgawker too!!! This bean dish rocks! I don’t even like lima beans but, I am ready to give them a second chance. Delicious! i had a recipe that was similar to this at a greek restaurant here in dallas. I am so glad to find a recipe for it! YUM! This looks great! Can’t wait to try it…hope you don’t mind if I repost on my blog! Leigh, thanks! I don’t mind if you repost the recipe, after all they all come from somewhere. If you do repost it as is, or use my picture I would want you to attribute it to here and link back. Thanks and let me know how it comes out.